Not to be confused with Bergmann Mars. The Mars Automatic Pistol, also sometimes known as the Webley-Mars, was a semi-automatic pistol developed in 1900 by the Englishman Hugh Gabbet-Fairfax and distributed by the Mars Automatic Pistol Syndicate Ltd. of Birmingham. It was manufactured first by Webley & Scott and later by small gunmakers in Birmingham and London. Manufacture ceased in 1907. The Mars Automatic Pistol is noted for being available in a variety of 8.5 mm, 9 mm and .45 calibres. These were all bottlenecked cartridges with a large charge of powder, making the .45 version the most powerful handgun in the world for a time. It used a unique long recoil rotating bolt action which ejected spent cartridges straight to the rear, and the feed mechanism is unusual in that it pulls cartridges backwards out of the magazine and then lifts them up into the breech face. 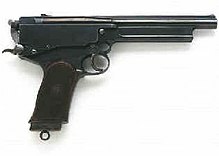 The Mars Automatic Pistol was rejected by the British War Office as a possible replacement for the Webley & Scott revolver, then in service with the British Army, because of the unacceptably large recoil, considerable muzzle flash, and mechanical complexity. The captain in charge of tests of the Mars at the Naval Gunnery School in 1902 observed, "No one who fired once with the pistol wished to shoot it again". Shooting the Mars pistol was described as "singularly unpleasant and alarming". It has since become a collectors' item because of its rarity and as an example of the earliest developments in semi-automatic pistols. A near-perfect Gabbet-Fairfax Mars sold at auction in 2002 for $35,250. On December 16, 1996, the Mars was cited as an example of a heritage arm during a debate in the House of Lords on gun control following Dunblane. ^ Geoffrey Boothroyd, The Handgun, Crown Publishers, 1970, pp.410–412. Myatt, Frederick (1984). Modern Small Arms. Crescent Books. ISBN 0-517-26288-6. This page was last edited on 7 December 2017, at 02:45 (UTC).